(Newser) – A woman who's modeled for Valentino, Versace, and Victoria's Secret is suing a Hilton hotel in California, claiming she was "massacred" by bedbugs. Brazilian model Sabrina Jales St. Pierre says she had a severe reaction to bedbug bites that required medical attention and affected her ability to model while staying at Palm Desert Embassy Suites two years ago. Attorney Brian Virag, who secured in October a $546,000 jury verdict over bedbugs at a Hilton Garden Inn, says the bites "covering pretty much her entire body" were among the worst he's seen. Jales St. Pierre was "embarrassed, ashamed, and humiliated" but had to keep working, he says, per the Palm Springs Desert Sun, adding "she still experiences psychological trauma" and is seeking monetary and punitive damages. This happened to me. It was awful. The welts were like hers. I suspect she is also allergic to bees. I am. No one ever told me the connection, but if you have a bee allergy then you are prone to have a bad reaction to other bug bites. I had to go to emergency care for the bed bugs. Also, I can see why maybe Embassy Suites didn't have bed bugs. It can take days, and up to a week for the bites to show. My bites kept appearing days after I got home, which of course was freaking me out. (All turned out good) So she must have gotten the bites somewhere she was before the Embassy Suites. Those dogs they send in to find them really do work. Its amazing to watch. Hate to be sexist, but i know what really bothers ladies: bugs. And a few other things. I suspect hotels have access to high tech bug control that every babe, mother, lady and grandmother would endorse. here's one link but more and better out there: http://www.planetorange.com/commercial-pest/hospitality-and-lodging/ also, a good bug contract may help liability problems, but I'm not a lawyer. 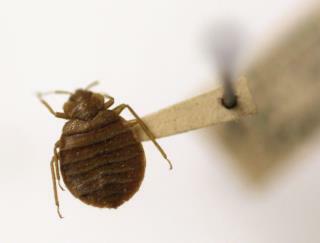 Hotels won't know about a bedbug infestation until someone gets bit and complains. If they sprayed after every room is cleared people would complain about the insecticides building up and potentially causing cancer. She must have lost a lot of money from missed modelling gigs, and endured much pain and suffering to deserve such a payout.